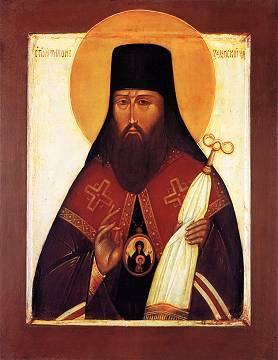 Born in 1724 in the village of Korotsk, in the Novgorod region, into a simple, peasant family, he received the monastic habit at the age of thirty-four and very soon, because of his ascesis and spiritual wisdom, was given higher and higher service until he was consecrated Bishop of Voronezh. He served as bishop for a little under seven years and then, because of ill-health, retired to the monastery of Zadonsk and entered into rest there in 1783. His wonderworking relics are kept there to this day. A great ascetic of the Russian Church, he was a rare shepherd, a man of prayer and the writer of beautiful spiritual works. In his wisdom, his holiness and asceticism, he could be counted an equal of the great Fathers of the Orthodox Church of former times. Because of the many witnessed miracles that were performed over his relics, he was first proclaimed a saint by the people, and then officially by the Church in 1861. From your youth you have loved Christ, O blessed one! You have been an example for all by word, life, love, spirit, faith, purity, and humility. where you stand before the throne of the Holy Trinity. O Holy Hierarch Tikhon, pray for the salvation of our souls! that He grant peace to the world and great mercy for our souls.